Contributions by Louise Chignac, Beth Collar, Arnaud Desjardin and Jonathan P. Watts. Design by Fraser Muggeridge Studio. 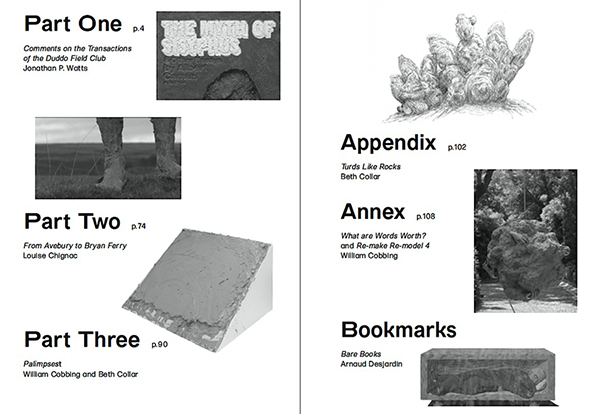 Transactions of the Duddo Field Club documents recent sculpture, video and performance by William Cobbing that were exhibited at Hatton Gallery in Newcastle, and mima in Middlesbrough. Retrograde images of ancient rock formations are the basis for oversized ceramic book covers of Albert Camus’ Myth of Sisyphus. Monolithic-looking sculptures derive their surface appearance from the anthropomorphic Duddo Five Stones in Northumberland, formed through pressing rocks into heavily grogged clay, a random selection of books then slotted into their surfaces; monuments to inaccessible knowledge and trivia. The book also features a collaborative performance Palimpsest with Beth Collar, a disjointed conversation in which words are scored in a wet clay surface, and are then distorted or erased through the act of continually reworking the surface. Language becomes a tactile experience. These mystical voices closely resemble that of chanting as if the stones themselves were ‘speaking’ in some ritualistic manner. In fact the montage of fast cuts of the stones in close-up that constitutes the intro suggests something of the anthropomorphic, as if the stones themselves were people or characters in their own right that will come to play their relevant part in this drama between the natural and the supernatural. A book can be lost and found. A book, used for what it is meant for, functioning in the proper way, is always contingent on the person holding it (reading it?) understanding what it is, the language it’s written in, the way pages make sense in a sequence (left to right, or the other way around), the way it sits with other related books. As a set of signs, from cover to cover, it requires acquired interpretive skills. The extraordinary marks imbued in the stones is a kind of ur-writing ; they receive their secret inscriptions over geological durations, durations that dwarf the human. ‘There are impossible scribblings in nature,’ he writes, ‘written neither by men nor by devils’. And in these scribbles a viewer might decipher proto-images of anything invented by human visual culture, so that ‘already present in the archives of geology, available for operations then inconceivable, was the mode of what would later be an alphabet’. A special cocktail ‘Airport Lounge Manners’ will be served from the Push Bar to Open hatch bar.